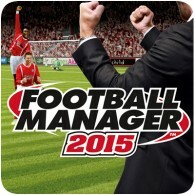 Are you ready for Football Manager 15? Anyone with more than a passing interest in football will have been following the FA Cup third-round draw on Monday evening and will doubtless have enjoyed the show put on by Blyth Spartans against Hartlepool United last Friday night in the second round. When a game comes with the official endorsement of FIFA (regardless of the other PR problems the organisation may be experiencing at the moment) you expect it to be at the top of its game. 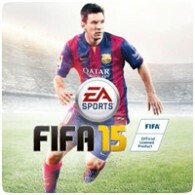 And FIFA 15 is as good as its 14 predecessors in this regard. We recently received a beta code to try out FirstPlay, the interactive magazine for the PlayStation 3 and similar to Qore. The first public episode of FirstPlay launches next week, on April 8th 2010. New episodes will be released weekly costing 99p each or gamers can purchase three-month subscriptions for £8.99, consisting of 13 episodes per quarter. We were recently invited down to a secret location near London Bridge to attend a Lost Planet 2 preview event hosted by Capcom. At the event we got a chance to play some 8 v 8 competitive multi-player and 4 player co-op. Here is what we though of the upcoming game, expected in May 2010. The Uncharted 2 multiplayer beta is currently underway until June 28th 2009 and we were lucky enough to get invited to join in through our GAP membership as well as being a Qore subscriber. We spent a few hours over the weekend playing the game to bring you our thoughts. AUTHENTIC UFC PERSONALITIES – Explore a deep roster of more than 80 top names in UFC competition across five weight classes and enter the Octagon surrounded by the sport’s popular commentators, announcers, referees, trainers, Octagon girls and more. 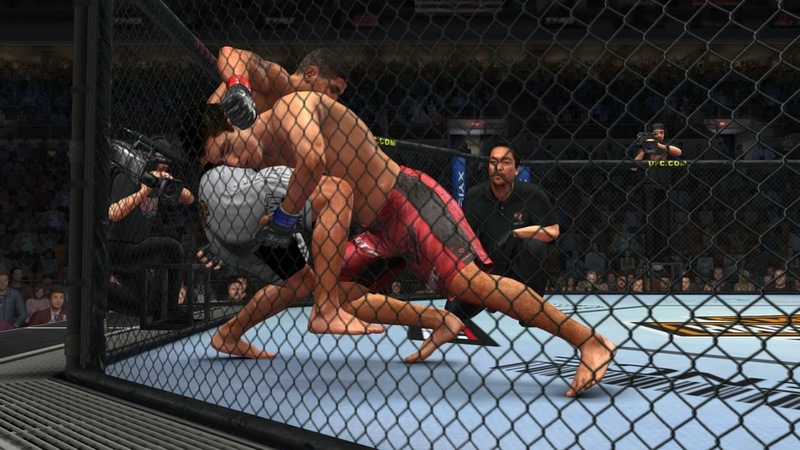 PHOTOREALISTIC MODELS AND EFFECTS – Experience the world of UFC as it appears on television with photorealistic fighters who breathe, sweat and move like their real-life counterparts. 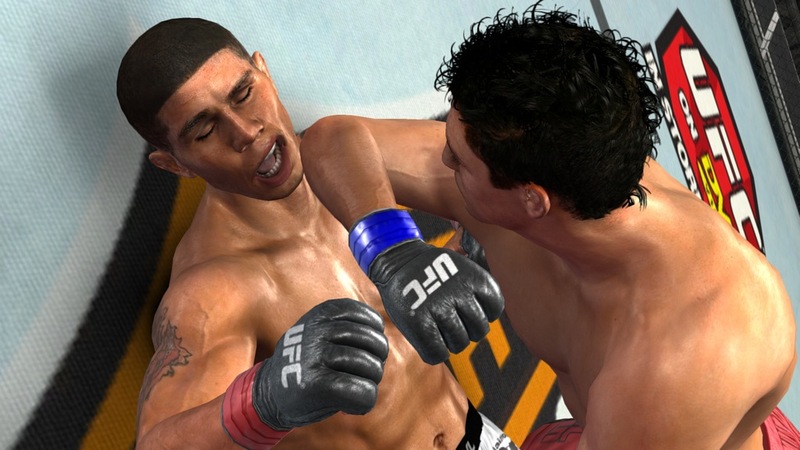 Players will also view amazing ripple effects across the faces and bodies of their fighters from the impact of devastating punches and kicks. CONSTANT CONTROL – Gain the upper hand in matchups with a brand new fighting game engine designed specifically for next generation systems. 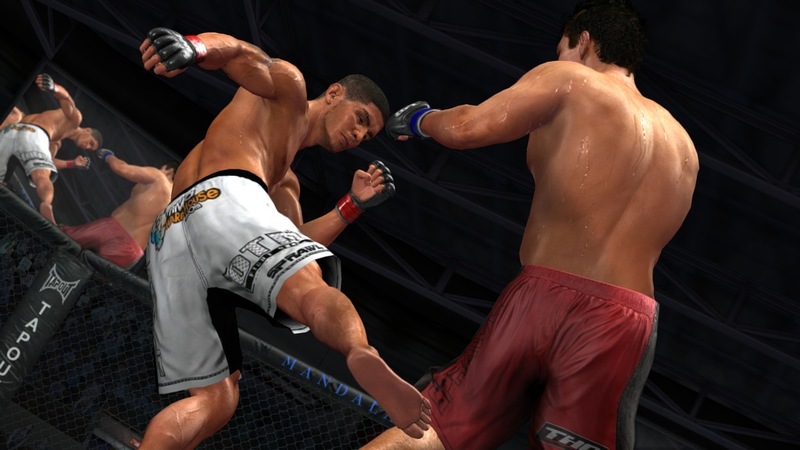 Emphasis on innovative, responsive and easy-to-play controls will give players unparalleled command of their fighters in the Octagon. FIGHTING DISCIPLINES – Take down opponents and get the submission with a variety of mixed martial arts disciplines, including Judo, Muay Thai, Wrestling, Kickboxing, Boxing and Brazilian Jiu-Jitsu. CREATE-A-FIGHTER – Jumpstart the career of a future champion by customizing your fighter’s physical appearance, learning new fighting techniques to use in the Octagon and managing the training process through attributes such as strength and cardiovascular health. Let us know what you think of the game. 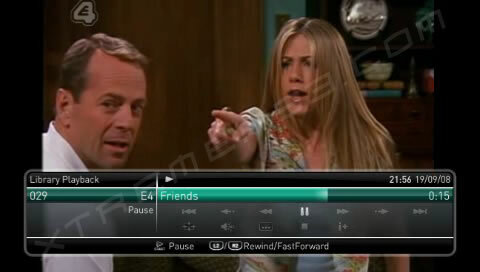 PlayTV is a PlayStation 3 accessory that turns the console into a personal video recorder (or PVR). Retailing for £69 (approx ?85), the device features twin tuners allowing you to record a program while watching another. The device uses free over-the-air TV frequencies to bring TV to the PS3. For us in the UK, we get over 90 different channels; over 40 of which are actual TV channels while the rest are radio and interactive channels. The device is currently available only in Europe (selected countries only). The PlayTV device weights less than 100g and is roughly 14cm x 7cm x 4cm. It is powered using the PS3’s USB port so no external power device is needed. PlayTV is available in the UK, Germany, Italy, Spain and France, with other countries to be announced soon. It is unlikely the device will make it to North America any time soon as digital over-the-air TV is hard to come by. If anything, North America may get a similar device in 2009. Installation is easy – simply pop in the DVD and follow the instructions. Some installation is required to copy the PlayTV program to the PlayStation 3; during the installation a short tutorial video is played to help with the waiting. The installation only takes a few minutes to complete, after which a [TV] icon will appear between the [Video] and [Game] XMB icons. When you launch the program for the first time, you are taken through the setup process. Once the setup wizard has searched for available channels you are ready to go. The entire process takes around 10 minutes (the channel search time will depend on your region). You can use a indoor aerial but for best performance, a outdoor one should be used. We were able to pick up all available channels using an indoor aerial. 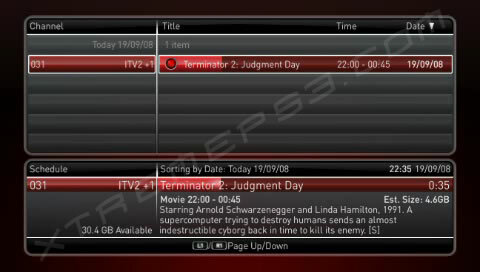 There are seven options on the PlayTV main menu: Live TV, Library, Schedule, Settings, Manual, Find and Record, and Guide; each of which are self explanatory. With the two built-in tuners in the device you are able to record from one channel while watching another, unfortunately you cannot record from two different channels at once. You are also able to pause Live TV and rewind or forward within the buffer zone. Depending on your settings, PlayTV can buffer when paused or all the time offering you more control on how you pause and rewind TV. Obviously, you cannot forward past the buffer zone. You can schedule programs to record using the TV Guide or by pressing the SELECT button on the Wireless Controller or Blu-Ray Remote. 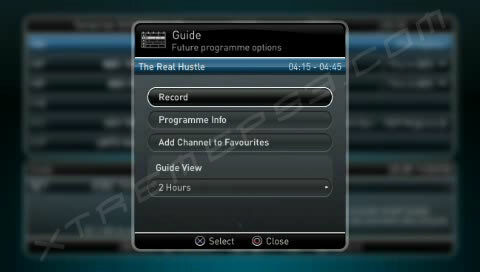 Unfortunately, the recorded programs can only be played back using PlayTV – you cannot access the video files from the [Video] menu on the XMB. This is because the video files are encrypted and stored in the [Game Data Utility] menu under [Game]. You can see a list of all the programs scheduled to be recorded on the Schedule. The TV Guide give you an estimate on how much disk space a program will take up if recorded. If you are away when a program is scheduled to record, the PlayStation 3 will turn itself on. If you are playing a game, the PS3 will also record in the background if you have enabled background recording. During background recording, however, quality of the game and recording may suffer. Background record can be enabled (or disabled) from the Settings menu. You cannot background record when playing PS2 games, and if a recording is in progress you cannot turn off the PS3 unless you cancel the recording. You can playback and manage any recorded content from the Library. You can use the onscreen menu or the Blu-Ray remote to rewind, pause or forward the video as needed. The library also keeps a record of what channel the program was recorded from. PlayTV is only compatible with SDTV signals but the quality of recording is great. Depending on your signal, the playback of recorded content as well as Live TV is as smooth as using a normal TV set. PlayTV is compatible with Remote Play so you can use your PSP to watch Live TV or playback content from your library. You can access all the features of PlayTV on the PSP so you can schedule programs, check the guide, watch Live TV or library content and even manage your library from anywhere around the world. Forgot to record your favorite show? As long as you have a PSP and access to a Wi-Fi Hot Spot, you can record or watch your program from anywhere. Of course, the quality of playback won’t be as good as accessing PlayTV through a direct Wi-Fi connection. Using PlayTV and Remote Play via a private Wi-Fi connection, the quality if playback is near UMD quality. There is no noticeable lag but this depends on the signal quality and the speed of your Wi-Fi connection. Due to copyright issues, you cannot transfer video files to your PSP, which is a big disappointment. It would have been great if you could copy any recorded TV to the PSP to watch on your commute to work. Hopefully Sony decides to enable this feature as originally announced. 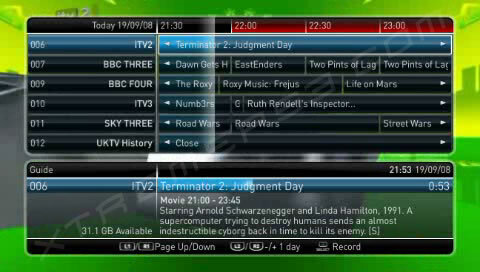 PlayTV is a well developed piece of kit. It is the perfect accessory for anyone who doesn’t already a PVR or digital TV service. The quality is great and works well with the PS3. There are only two major problems with the device: firstly, you must start a separate program in order to watch TV with adds to the loading times; and secondly, you cannot transfer files to an external device or the PSP. There is an software update option in the settings menu so hopefully Sony addresses these two issues in the future. Over the last week and a half, we’ve been playing the SOCOM: Confrontation beta, now that it is finally available. We’ve decided to break from playing the game to bring you our impressions on the game. It’s taken some time, but SOCOM is finally here on the PlayStation 3. The franchise enjoyed much success on the PlayStation 2 and the new title is looking to fantastic. 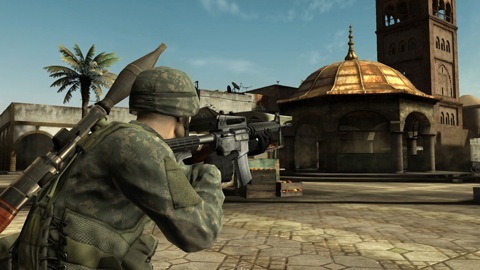 SOCOM: Confrontation is an online-only multiplayer game, allowing up to 32 players to battle it out across seven maps. Even though the servers are overloaded currently and there is noticeable lag in the game, the game is still good. Due to the high number of users in the beta and the lack of planning from the developers side, there are frequent disconnects and trouble connecting to the servers at times. It’s disappointing that these problems were addressed earlier, especially since other games suffered the same fate early on (MGO anyone?). Let’s hope SlantSix get their act together and upgrade the servers before the game is released. In other disappointments, the game is quite buggy this close to release. A patch has already been released to address this and the above server issues, and another is on it’s way. There is no feedback website for the beta to report bugs/issues, which means SlantSix have no way of finding out what is going wrong. Let’s hope the game doesn’t get delayed again! For those of you lucky enough to be in the beta, make the most of it now. There is still another two weeks to go before the end of the beta testing phase so if the game does get delayed, at lease you have a good play before anyone else. Furthermore, will SlantSix even fix anything between the beta and the final release? Now lets talk about the good bits. The graphics are amazing [for an online game] with highly detailed character models and attractive environments. The weapons look realistic and there is a nice range of different weapons to choose from. There are a lot of customization options too, from outfitting your character with different clothes and accessories to customizing your weapons and attachments. You can change your character’s clothes, apply camouflage, put on boots and add other apparel. You can then choose from 37 real-world weapons, including hand guns, assault rifles, grenade and rocket launchers. The terrorists are no longer part of the action, instead there are commandos versus mercenaries. In addition, you are no longer limited to the US Navy Seals – you can also choose to play as the British SAS, French RPIMa and more. Each side features unique weapons and equipment. You are also no longer limited to a certain class (assault, sniper, support etc.) so you are free to equip yourself as you like. Team work is always an important part of combat, and Confrontation is no different. You can join or create a clan, where you can further customize the options. You can create a logo and uniform for your clan, create a online profile, schedule matches on the community calendar and more. 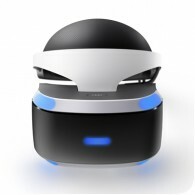 Like in most games from the franchise, you can communicate with players in the game using a headset. SOCOM: Confrontation will be the first game to come with the official PlayStation bluetooth headset. There are seven maps set in North Africa, supporting up to 32 players. Each map has day and night variations and scale depending on the number of players involved. Players can use the environment to their advantage (or disadvantage). Through use of the bullet penetration system, players can shoot through thin walls and other structures or blow up vehicles. The action is slower that that of Call of Duty 4, so players will need to adjust to the slower paced action. That being said, players of Metal Gear Solid 4 (or MGO) will find the action slightly faster. Your character will take a few seconds to reload and their running speed will vary depending on their equipment. Wearing heavy armour will show your soldier down but will offer better protection. Despite having issues, SOCOM: Confrontation is looking to be a welcome addition to the PS3. SlantSix will need to get the server issues and bug fixes out of the way before the game comes out next month (if all goes well). Fans of the game will certainly be impressed with what has been achieved so far, so lets hope the beta will solve any immediate issues with the game. Check out the game at TestFreaks! We’re written that SOCOM: Confrontation has “amazing graphics”, but please remember that this is an online only game. Online games need to have lower quality graphics compared with normal “offline” games and they need to reduce the amount of data being transferred between the console and the server (via the Internet). More graphics mean more things to keep track off, which means more data transfer and thus causing lag. When we talk about graphics, we are comparing it with other online games.